What Is the e-Factor®? – It is a propriety research model specifically designed to measure the emotional reactions to critical brand building initiatives – e.g. advertising, packaging, new concepts, brand names/tag lines, promotions, brand imagery, etc. This model is based on the emotional profile index developed by a leading social psychologist, Robert Plutchik , which identifies 8 basic emotions that serve as the foundation for all human emotions. 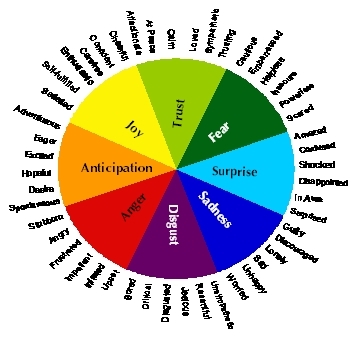 Each of these eight primary emotions are further defined by 6 sub-emotions of varying intensity, to more fully understand and analyze how consumers feel about the marketing stimuli presented to them. Why So Important and Relevant – Only an emotional benefit fulfills the ultimate need for self actualization, critical for creating a compelling, distinctive brand. Strong brands have an intense, emotional connection with the consumer. Loyalty is built on feelings for a brand that go beyond a rational interest in how a product performs. The key opportunity for brands is to develop a meaningful emotional relationship with consumers. How It Works – E-Factor will measure how well your brand/marketing bonds emotionally with consumers, and how to strengthen this important emotional connection. Goes beyond the normative measurements for communication, purchase behavior and distinctiveness. Uses a four step process which covers initial emotional reactions, then probes for more specific feelings and why they felt that way. Includes open-ended questions so all possible emotional responses are identified. The results are quantitative and hence projectable to the marketplace. Enables clients to evaluate and improve upon the emotional profile of their brand, the essential component for building compelling brands. Provides actionable insights on the current brand image, whether/how marketing initiatives enhance the brand, and can even uncover emotional “market gaps” versus competition and key category/consumer desires for new product development.